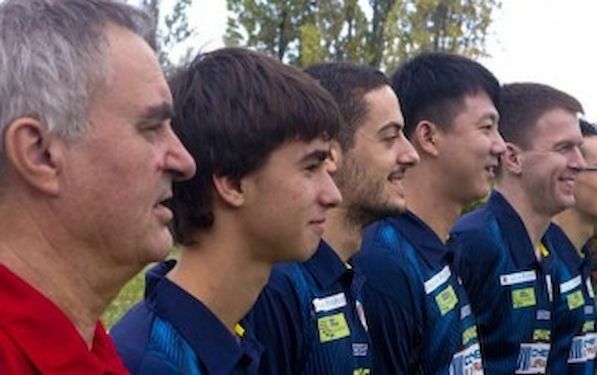 Pontoise finalized the excellent weekend for French clubs in Men`s European Champions League, beating at home Swedish Eslov Ai 3:0 in Group B. WANG Jian Jun & Company joined UMMC in the quarter final from this group, while Saarbrucken goes to ETTU Cup. Two French teams booked their places among the best eight European clubs, Chartres and Pontoise, while Hennebont and Angers has a huge chance to follow them. On the other side, the best national league, German Bundesliga, will be represented in the next stage just by its champion Werder Bremen. But, noting that Ochsenhausen still has mathematical chances. Round 6 to be held on December 20th. Tonight, at Pontoise, the host team confirmed its class against former MECL quarter finalist. Marcos FREITAS played very well against Robert SVENSSON in opening clash, winning in straight games. Second set was full of upheavals (1:3, 5:3, 5:8, 9:9, 9:10, 12:10) and Swede couldn`t recover after missing the set ball. Ultimate set was concluded by three points in a row of the host. WANG Jian Jun needed four sets against Mattias OVERSJO. Chinese saved one set ball in second (10:11, 13:11), but guest refused to give up, reaching third set. In last one former Charleroi`s player dominated. The single junior champion of 2011 European Youth Championships at Kazan, Tristan FLORE won third point for Pontoise, overcoming Kasper STERNBERG in four games. Dane saved three set balls in opening chapter, but the rest of the game belonged to young Frenchman. STERNBERG didn’t use a set ball to level on 2:2.